The Basilica di Santa Maria del Fiore/Flower, dominates the central square in Florence, Italy. Construction began in 1296 and was completed in 1436. It stands on the site of an earlier church erected during the 7th century. Identified as a basilica or duomo, the complex of buildings at the site a cathedral, it is the home congregation for the Archbishop of Florence. Wow. When Terry and I visited Florence in 2011, 575 years after it was completed, I had to marvel at the comparatively pristine condition of the complex. Our day in Northern Italy would not have been complete without visiting this architectural marvel. The architecture is alternately described as Gothic, Classic and Romanesque, because it has elements of each of those styles and more. The world was changing in the late 1300’s and the early 1400’s. The architecture of this magnificent structure was changing with it. At the extreme right in the photograph is the bell tower, or Campanile, the second of the three buildings in the cathedral complex. It’s design and construction were overseen, until his death, by the famous Italian architect and painter, Giotto di Bondone. The pink, white and green facade reflects the natural colors of the marble from which the facade of the building was constructed. The intricate designs, exquisite windows and interior and exterior sculptures and Biblical works of art, are characteristic of the churches of Northern Italy built at that time. But this is no less a masterpiece. 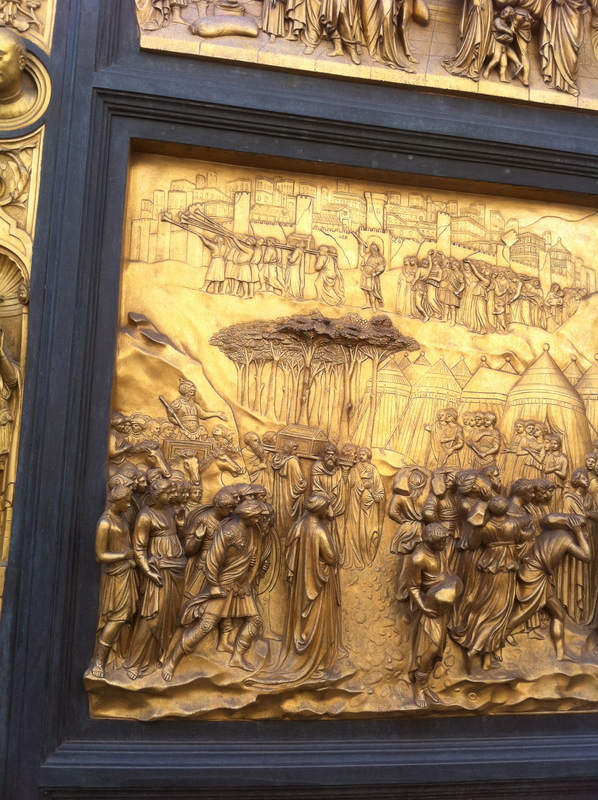 I particularly focused on the gilt bronze panels on the doors that are situated on three sides of the duomo. Additional, similar doors are on the baptistery, the third buildings in the cathedral complex. Like every other aspect of the cathedral, the craftsmanship and detail are of the highest quality. They evidence that the finest artists and intellectuals gravitated to Florence and helped usher in the Italian Renaissance. Look at the detail of the faces and the elegance of the horns. Surrounded by galleries, palaces and museums, the cathedral establishes Florence’s role as a center of culture in the 1400’s. Not surprisingly, the historic centre of the city is designated a World Heritage Site by UNESCO. It shares that designation with Dubrovnik, Croatia, which has also been featured on this blog.